Discovered in 1995 by Weinberger. Barbara Wilson describes this one as: "Faint but clearly visible as a round evenly illuminated glow with no resolution even at 450 power. [..] Inside of a sideways 'V' shaped asterism of stars." 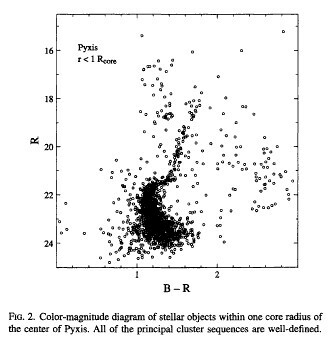 The Pyxis Globular Cluster was discovered by Ronald Weinberger in 1995 when scanning various optical surveys (POSS, ESO/SERC) for new interesting objects. He found this object to be detectible only in the infrared and classified it as globular cluster candidate similar to AM4, or potentially a nearby dwarf galaxy (Weinberger 1995). Subsequent investigations by Demers, Irwin and Kunkel with the UK Schmidt Telescope (Demers et.al. 1995, Irwin et.al. 1995) as well as Da Costa (1995) with the Anglo-Australian Telescope have confirmed its nature as remote globular cluster.